Cruising with an infant? Let us be the first to tell you it’s a whole other ballgame compared to cruising without a kid. (Read our advice and tips on cruising with a baby here.) But as a parent, we don’t have to convince you that things are much different with babies. 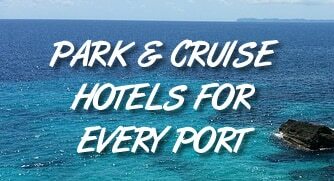 And while you can expect your cruise to be a lot different, your packing is also different than if you were sailing solo. During our trip, we packed all sorts of things just to be prepared for any situation. Here are 12 items that we brought that made our trip much easier. If you are formula feeding your child, then make it easier on yourself and get some bottled water for your cabin. Usually you have to order it through the cruise line and it will be waiting for you when you board. Having bottles of water ready to go are so much easier to make formula instead of going to the buffet to fill a bottle. The silicon mat made finger food much cleaner than eating off the table. Does your baby eat finger foods? If so, you know that things can get kind of messy. We brought along a silicone placemat for our son to eat off of. These mats stick to anything and keep a nice barrier between your kid’s food and the table. You can find them in all sorts of colors on Amazon. Thinking of bringing a big jogging stroller on your cruise? Leave it at home. Instead, pack a small, lightweight folding stroller. Navigating crowds and the ship is a breeze in a smaller strollers, plus it can fold up to fit in your cabin closet when not in use. Small strollers can be found for about $60. Yes, you are going to the warm Caribbean. Still, with the wind whipping and the sun setting, it can get downright cold on the ship sometimes. Don’t just pack shortsleeve items for your kiddo. Be sure to bring something warm like a jacket and long pants. Thankfully sound doesn’t travel all that well between cabins. However, it definitely travels between the hallway and your cabin. If you don’t want the loud talking of passers-by to wake your kid during naptime or at night, then we suggest bringing along a sound machine. It can drown out other noises and keep your kid sleeping happily. $25 is worth is for a good night’s sleep. One of the weirdest things about cruise cabins is that they usually only have one plug. With all of today’s electronics that many people pack, that’s just not enough. One of these $5 outlet taps can plug in without taking up too much space and gives you three outlets instead of one. Out at sea, cruise cabins can get extremely dark. Packing a small nightlight can help you navigate an unfamiliar room if you have to get up in the middle of the night to calm a crying baby. Nothing worse than stubbing your toe in a dark room! These three items should be no-brainers, but they are important enough to mention. The sun in the lower latitudes is so much stronger. The delicate skin of a baby can burn in just minutes. The first things you should pack are a hat, sunscreen, and aloe to help protect your little one from the sun and nurse an accidental sunburns. If your baby wears diapers, they won’t be allow in most cruise pools — even if wearing swim diapers. Still, you can take your baby into the ocean when in port. Bring a pack of swim diapers to keep them clean, even when wet.